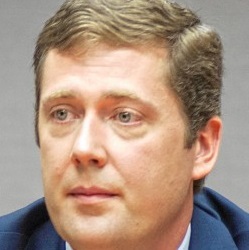 Colin Van Ostern is one of five Executive Councilors in New Hampshire, representing one-fifth of the state's population, which is about 265,000 people. The council approves state contracts and state appointments. Previously, he worked on the campigns of several Democrats including U.S. Sens. John Edwards and Jeanne Shaheen and U.S. Rep. Annie Kuster. He's a senior adviser for Southern New Hampshire University and formerly worked as brand manager at Stonyfield Inc., a popular yogurt company in Londonderry, N.H. He has a wife and two children.